The High-quality copper wires in this lightning cable offers faster & stable charging and syncing,built-in chipset ensures safety for your lightning devices. Tangle-free and well-constructed nylon braided cord has an ultra-high 4000+ 95-degrees bend lifespan,which largely improve its durability and extend the life of cable. The Lighting to USB connector is reinforced with green TPE material,it is hard to break and can be plug more than 8000 times.The USB connector is anti-rust because it is made from alloy. 4 Pack Lightning cable in assorted lengths(6FT 6FT 10FT 10FT) is the ideal length for usage at home, office and Car,Never worry about not having sufficient reach from your USB charger cable. For iPhone:X,8/8 Plus,7/7 Plus,6s/6s Plus,6/6 Plus,5,5s,5c,SE. For iPad:Pro 12.9",Pro 9.7",Air, Air2,Pro,mini,mini 2,mini 3,mini 4,mini 4th generation. For iPod:touch 6,nano 7th,touch (5th/6th generation),Beats Pill+. All customers can enjoy a free replacement or full refund within 12 months for every purchase from W&O. If you have any issue with our product, please contact us first before leaving feedback/review.We will strive to fix the issue to your full satisfaction Guaranteed. 1.Please ensure the power output do not exceed 2 A/5V or 6V/3A when charged with our lightning to USB cable. 2.Please avoid covering the charging cable or phone with any non-thermal covering,such as quilt,blanket. [Faster Charging & Data Sync] High-quality copper wires enhance charging & data transfer speed of the iPhone cables.Great performance makes your devices syncs and charge simultaneously with 480 mb/s (Max) transferring speed. With the new technology of Trickle charging,this lighting charger cable will reduce the damage of battery when it was over charging. [Durable Nylon Braided Jacket]This iPhone charger cable which was covered with nylon-braided jacket is flexible and tangle-free, which have been tested to bend 95-degrees 4,000 times.W&O lightning cable is more durable and sturdier than the original iPhone lighting charger cable. [Sturdier Lightning & USB Connector]The 8 Pin lightning connector which can be plug more than 8000 times and ensure effective data transfer. The small connector head fits most cases so you can charge or syncs without take off your phone case friendly.Both connector was reinforce with green TPE material can protect the core from any bending. [Universal Compatibility] For iPhone X, iPhone 8 /8 Plus, iPhone 7 / 7 Plus, iPhone 6s / 6s Plus, iPhone 6 / 6 Plus, iPhone 5 / 5s / 5c / se,AirPods,iPad Pro, iPad Air 1 / 2, iPad mini 1 / 2 / 3, iPod nano7, iPod touch and more apple devices. 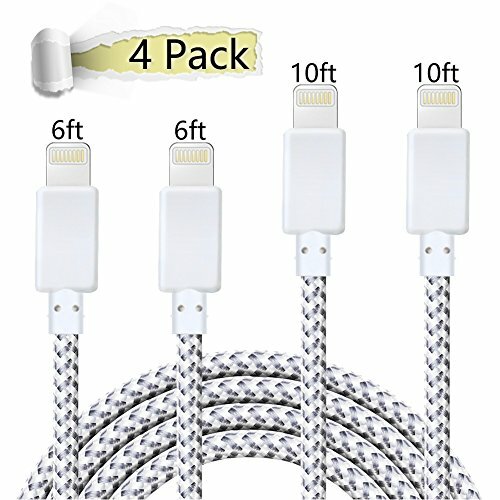 [Package List]4 pack USB to Lightning cables in assorted lengths (6FT, 6FT, 10FT, 10FT) You can charge your iPhone, iPad on the bed, on the sofa, or in the office from different distance. All customers can enjoy a free replacement or full refund within 12 months for every purchase from W&O. If you have any questions about this product by W&O, contact us by completing and submitting the form below. If you are looking for a specif part number, please include it with your message.